Mao’s Great Famine: The History of China’s Most Devastating Catastrophe by Frank Dikotter is definitely one of these books. A “social history” in the best sense of the word, Mao’s Great Famine focuses on the leadership, the implementation, and the consequences of the man-made famine that killed at least 45,000,000 Chinese. Dikotter convincingly argues that the Great Leap Forward had a higher death-tool and was more disruptive than the Cultural Revolution, as the Great Leap Forward primarily targeted farmers. The book is a useful addition to my library. 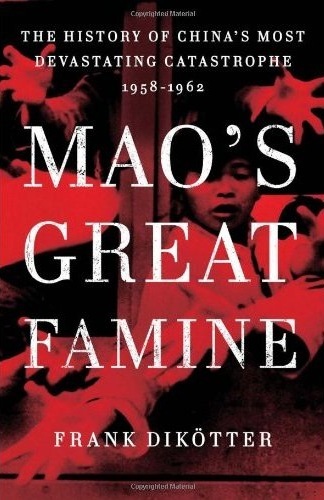 Unlike most histories of the Chinese Communist Party , Mao’s Great Famine is primarily a social history concerned with the experience of common Chinese during the autogenocide that killed approximately one out of every ten Chinese people. The book begins, and ends, on the top. All the usual suspects are there. The thoughts of Chairman Mao are always correct… Chairman Mao’s superiority has many aspects, not just one, and I know from experience that Chairman Mao’s most outstanding quality is realism. What he says is much more realistic than what others say. He is always pretty close to the mark. He is never out of touch with reality… I feel very deeply that when in the past our work was done well, it was precisely when we thoroughly implemented and did not interfere with Chairman Mao’s thought. Every time Chairman Mao’s ideas were not sufficiently respected or suffered interference, there have been problems. That is essentially what the history of our party over the last few decades shows. So many people have died of hunger.. History will judge you [Mao Zedong] and me, even cannibalism will go into the books! The Three Red Banners have been shot down, now land is being divided up again… What have you done to resist this? What’s going to happen after I’m dead? Dikotter does introduce new facts about the high-levels of government during the Great Leap Forard. For instance, Dikotter documents that the massive grain shipments to the Soviet Union during the Great Leap Forward, which are often cited by Chinese as a reason for mass death, but traditionally denied by western historians, actually did happen, Likewise, Dikotter at least implies that Mao’s paranoia of Peng Dehui‘s cooperation with Soeviet authorities wasn’t entirely baseless. But Maos Great Famine does not end there. Indeed, it just begins. In the context of the Great Leap Forward, the way for a bureaucrat to be promoted was to report an increase in one of the few metrics that mattered (say, grain produced in the county). The way not to be fired was to simply obey the instruction to collect farm taxes in the form of, say, 30% of the reported harvest. The logical end-point of this is reporting a harvest 300% larger than the actual harvest, and collecting 100% of the actual harvest to pay in taxes. But in another sense, this hides what happened. The story of Mao, Zhou, Liu, and Lin is the story of the leadership. The mundane world of the bureaucrats is the world of the mechanism. The section of the book titled “Ways of Dying” is what actually happened. The motivation of a starving worker to work is his fear of torture less his weakness from malnourishment. Mao’s Great Famine, especially the ways of dying section, was a hard book to read. It is also a hard book to review. It is written by a European, and thus the style is different from either the nostalgic nature of Chinese histories, or facts-first nature of American histories. This is a good book to read, and it makes a persuasive case for a minimum death toll of 45 million. Mao’s Great Famine is best read along with The Party: The Secret World of China’s Communist Rulers. One tells how the Party reacts in bad times, and the other in good, but it is the same party, the same mechanism, the same people (or their children or grandchildren) — only the leadership has changed. This is a disturbing book, and not a comfortable one to read, but critical for understanding the nature of Maoâ€™s rule. The book feels like a Zombie stuff. Social histories of the Mao years read like screenplays from SAW prequels.